Traces of the Dragon is a documentary about the lives of Jackie Chan’s parents, the details of which were unknown to Jackie Chan himself until some time around the filming of this documentary. Crazy as that sounds, it’s true; his parents were focused more on surviving and keeping the family afloat than regaling their young son with tales from their lives before he was born. Jackie wasn’t around his parents for much of his youth, anyway. His distaste for regular school led to a 10-year, contracted enrollment in the Peking Opera school where he would meet Sammo Hung and Yuen Biao, laying the groundwork for his life of entertainment and death-defying stunts. And from the way they talk about it in the film, it doesn’t seem like Jackie did much of anything but practice his skills during these school years. Jackie Chan may have gone on to become a global star, but his parents’ lives are actually far more interesting and worthy of a documentary than his. It’s such a moving tale that the director of the documentary — well-respected Hong Kong filmmaker Mabel Cheung — would later dramatize it into the 2015 film A Tale of Three Cities. They not only lived through the Second Sino-Japanese War and the continued Chinese Civil War that followed it, his father was involved in the war as a Nationalist operative and both of his parents were hugely affected by these country-wide struggles. Their story is one of war, refugees, and making the hardest choices that life can throw your way. Like Jackie, his father is a charismatic man, and watching Jackie with him is endearing and immensely humanizing for the star. Traces of the Dragon does a great job of allowing Jackie’s father himself to tell the story (his mother was too ill at the time to tell her own story, though she does appear in the film), but what really takes the film to the next level is that through their stories of war and strife it becomes apparent that their story is just one among millions like it. The Chinese people of this era had rough lives blown apart by the wars, and so the film becomes much more important and historically relevant than just detailing the lives of a star’s parents. It is a personal look back into the past, a phenomenal tale of survival that typifies the Chinese experience of the time. 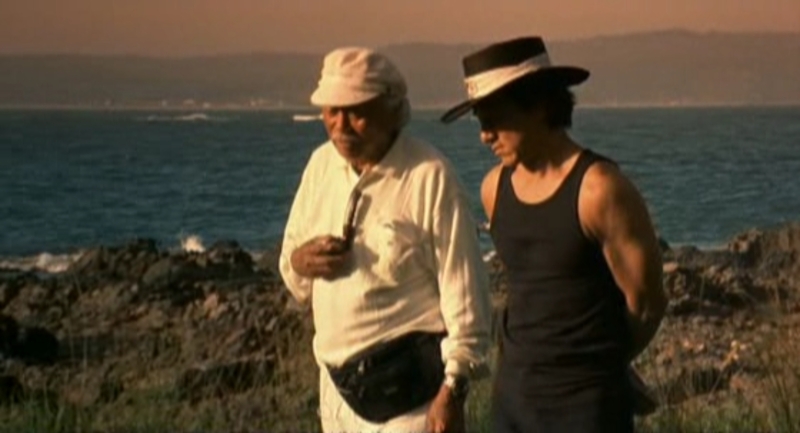 A big part of the documentary is the story of how Jackie is actually not an only child as he thought for most of his life. He has two half-brothers on his father’s side, and two half-sisters on his mother’s. All of the siblings are also interviewed about their own lives, which, like their parents’, were not easy in the slightest. Both sets of siblings were left behind in mainland China by their respective single parents, so they were forced to get by any way they could. Just the fact that the brothers are alive is astonishing, as the oldest was only around eight years old when his father was forced to leave them behind. 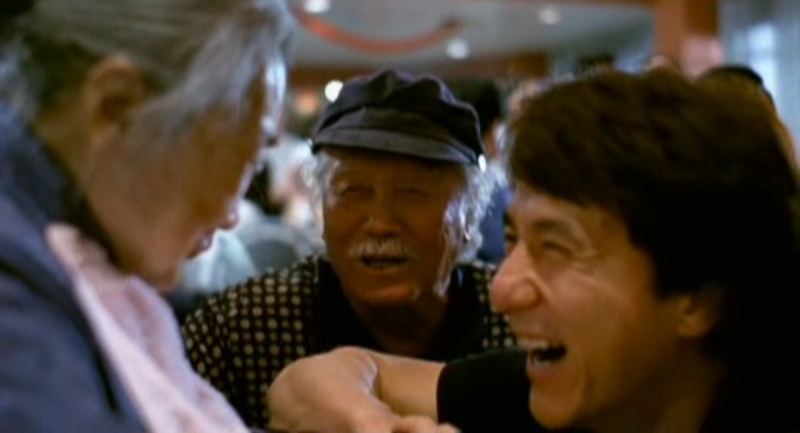 As a Jackie Chan fan, Traces of the Dragon places his struggles as an artist into perspective. Out of the millions affected by the wars in China, all the pieces somehow aligned to give the world Jackie Chan. This is amazing, and without Jackie Chan’s influence the entire Hong Kong industry (and in turn, world cinema) would have been forever different. This is meaningless in the face of the struggles enduring by the wartime Chinese, but it did make me think about how art survives through the support of others. In a weird way, it makes sense that an artist as intense and successful as Jackie Chan would have a tale of this magnitude that elevated him into the position to be everything he could be for his art. The Chinese spirit is a remarkably resilient one, without a doubt. Next up in this chronological journey through the films of Jackie Chan is the globetrotting Around the World in 80 Days! See ya then!